When I was younger and it was time to take down all the colorful, ornate and sometimes over-the-top decorations that go along with the Christmas season I was disappointed that I wouldn’t get to enjoy these beautiful decorations for another year. More recently though, I’ve found by the first of the new year I’m ready to trade it all for a more simple and natural look. 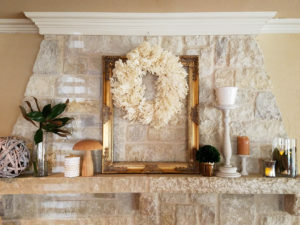 The past few years I’ve gone with a clean yellow and white color scheme but this year I find myself not wanting to give up the warmth and luxury that came with the colors and sparkle of Christmas. 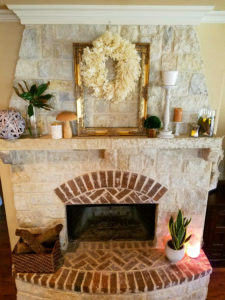 I don’t know if it’s because it still seems colder outside or maybe it’s because I wasn’t actually home for Christmas this year so I haven’t yet gotten tired of the heavier décor. Whatever the reason, this year instead of changing out my pillow covers to lighter colors I kept the warmer reds and browns I had over the fall and winter but lightened thing up a bit with mostly neutral accessories. 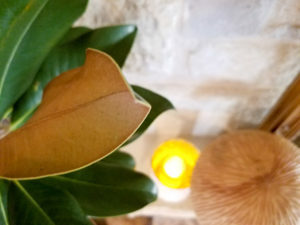 I love bringing things that traditionally belong outside inside, like outdoor pots and these magnolia leaves. I never really got magnolias until I lived in the south, but now I love them. Besides being beautiful and elegant they look just as stunning in winter as in summer, maybe even more so because they don’t lose their leaves and are therefore one of the few lush green sights in an otherwise cold and barren landscape. 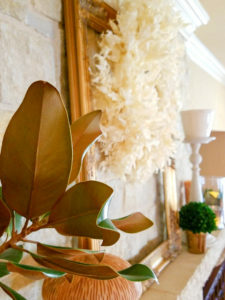 This year not only did we use our magnolias as the backdrop to our Christmas card but I brought both their leaves and branches inside for my after-Christmas-décor. 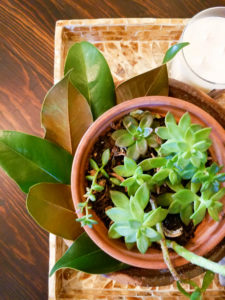 Their beautiful two-sided leaves, bright green on one and a velvety caramel on the other, maintain their color for ages after being cut which makes them perfect for displaying inside. 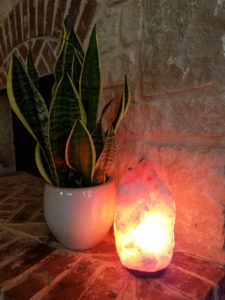 I also incorporated several Himalayan pink salt lamps and a Sansevieria plant my sister sent me home with after Christmas. 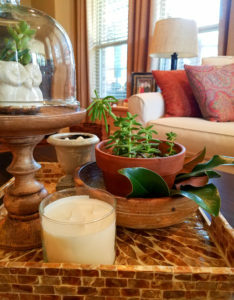 Sansevierias are one of the top oxygen generating houseplants and super simple to take care of, which make them fit in perfectly with the clean and simple feel I was after. Now, on to the Himalayan pink salt lamps. I’m a little bit obsessed with Himalayan pink salt lamps right now. I’ve seen them for years in health food and herb stores, and more recently stuck between doodads on the shelves of Home Goods, but lately I’ve become infatuated by them. They are quite literally just big chunks of Himalayan pink salt. I can attest to this because, in an effort to ensure the lamp I was buying was real, I licked it. Yes really. And, before you judge me thinking “Eww.. who goes around licking lamps in stores..?” Just know that it’s not only me that does things like this. When my sister and I were out shopping for these lamps and I was telling her I read that you had to be aware of cheap imitations, she casually responded “Oh it’s real, I licked it”. Genius obviously runs in our family. So, what is so great about these lamps that they would cause an otherwise normal person to go around licking things in stores, you ask? Well, recently when I was admiring one in an herb shop, (and no, it wasn’t that kind of herb shop, although that would be a good excuse for the subsequent lamp-licking…) the woman who worked there told me they are amazing at generating negative ions which neutralize all the positive ions in the air around them. One of the ways positive ions, aka free radicals, are created is from electronic devices like computers, TVs and microwaves. The initial research I did on these lamps supported this theory, touting a wide range of benefits including cleaning and deodorizing the air, reducing allergy and asthma symptoms, increasing energy levels, increasing blood flow and levels of serotonin in the brain and neutralizing electromagnetic radiation. As I researched further I learned that while these lamps probably aren’t actually capable of generating enough negative ions to counter all the positive ions in our immediate environment they do still have some good benefits, such as helping to purify the air via the salt’s hygroscopic process. This, in a nutshell, is salt’s ability to absorb moisture from the air. These moisture particles hold onto tiny bits of dust and other contaminants so when the moisture is absorbed by the salt lamp these contaminants get stuck on the salt itself (this is why it’s good to clean your salt lamp with a damp rag every few weeks). There’s a lot of research out there on the effectiveness of these lamps but the bottom line appears to be that while they may not be the miracle workers some would claim, they are beneficial in helping to purify the air. 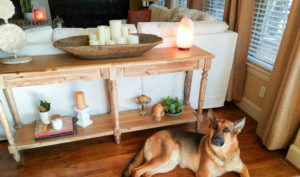 Living with big dogs as we do, I am constantly looking for ways to keep the dust and dander to a minimum while keeping our house smelling clean (or rather, not smelling at all) and, in truth, I was getting tired of little dishes of baking soda we had littering every surface. So even if these lamps help just a little, I’m in. Plus, I love the warm and natural glow they emit, especially at this time of year- though I do believe I will be just as enamored with them come summer. I’ve noticed from the lamps I’ve collected so far, the darker ones which have more of a red or orang-ish color to them omit a very rosy glow as opposed to those that are a lighter pink or almost white, which omit a lighter, brighter glow. 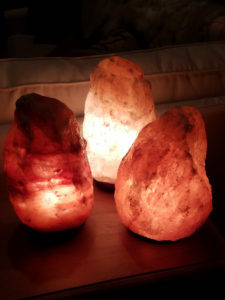 By the way, probably the most interesting thing I learned when researching Himalayan pink salt lamps is that they don’t come from the Himalayas at all. They are actually mined in the Pubjab region of Pakistan, almost 200 miles from the actual Himalayas. 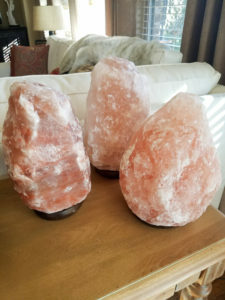 I can’t wait to find a Himalayan pink salt lamp for my home! Yes Leanna, you totally need to get some! Let me know what you think when you do! They do give off an amazing glow. I can’t sleep with one on in the bedroom but we leave the ones in the living room on 24/7 so, if for some reason, I’m up in the middle of the night it makes me happy to walk in there and see the cozy glow. 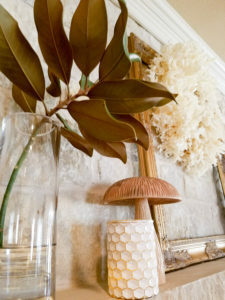 Your house is always beautiful and inviting but I’m so glad you enjoy these lamps as much as I do! I just bought two new salt lamps; I had one that I bought last year. 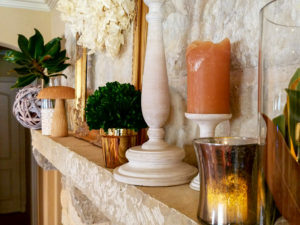 They do give a soft, warm, rosy glow that really enhances any decor. They really do, and 9 months later I still love the glow – even in the heat of summer!